One of the pictures in the Chicago Tribune of 5/11/1977. 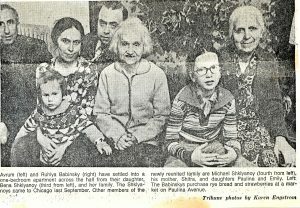 Left to right: Avram Babinsky, Bena with Polina Shklyanoy, Mikhail Shklyanoy, Shifra Zhivotovskaya, Emily Shklyanoy, Rakhil Babinsky. 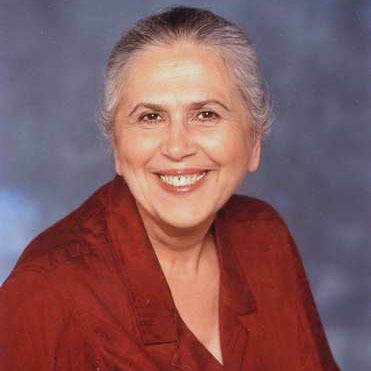 Living History: The Immigrant Experience From Russia to Rogers Park was the name of my presentation for the Rogers Park/West Ridge Historical Society on February 26. More of a tour of my family’s first years – 1976-1982 – than a presentation. 6948 N. Ashland Blvd at Morse Ave in East Rogers Park, Chicago. 2017. Stop 1. 6948 N. Ashland (corner of Morse). 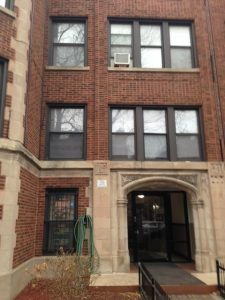 The Jewish Family Services (2710 W. Devon) placed us in a furnished 2-bedroom apartment. We had two weeks to rent a permanent place. As we were bringing our suitcases in, another family was bringing their suitcases out – husband, wife and girl of five or so. Our morale got a boost when we learned that these old-timers too emigrated from Kiev and that both husbands were structural engineers. 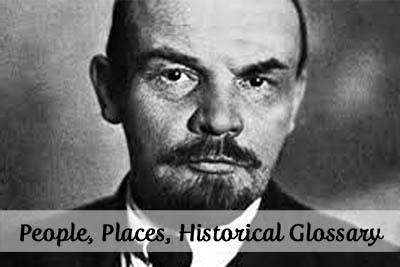 Considering that we knew not a soul outside the Soviet Union, this encounter equated to discovering long-lost family. About a dozen years later, that family founded LifeWay Foods. 7004 N. Paulina St at Lunt Ave in East Rogers Park, Chicago. 2017. Stop 2. 7004 N. Paulina (corner of Lunt). We found jobs, bought a tank-size gas-guzzling Ford Galaxy-500, and lived through two record snowfalls. I learned to parallel park and changed careers. 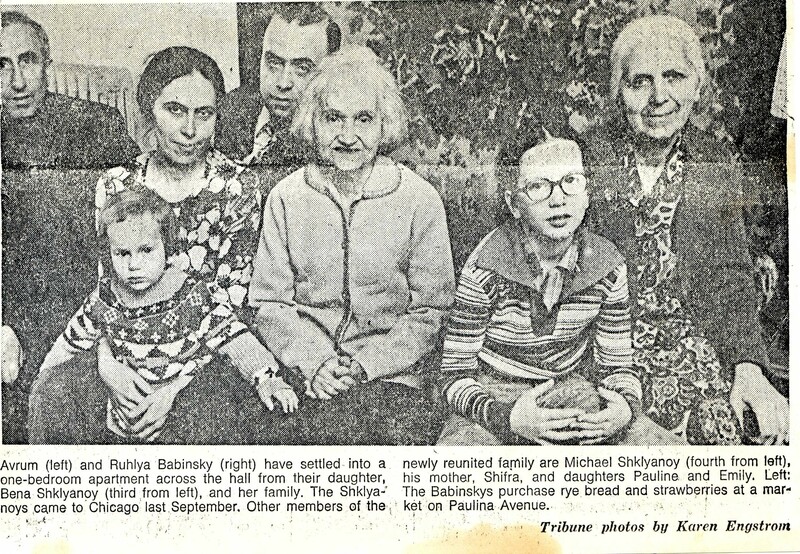 My parents joined us, the 1000th Russian immigrants to Chicago. 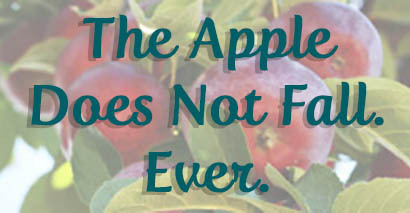 They adjusted in no time, with one exception: for a while, my mother refused to pay sales tax. Luckily, the small North Water Market nearby, the future Fresh Farms, knew to let me pay it for her. And the owner of Towne Shoes let her get away with it altogether. Stop 3. 6130 N. Washtenaw. Normal American life. 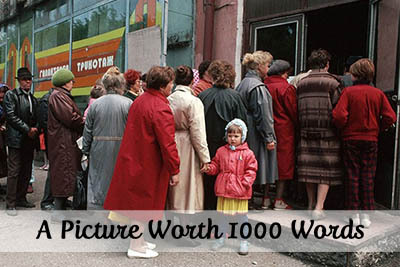 Russian stores, restaurants, and small businesses opened and most flourished. 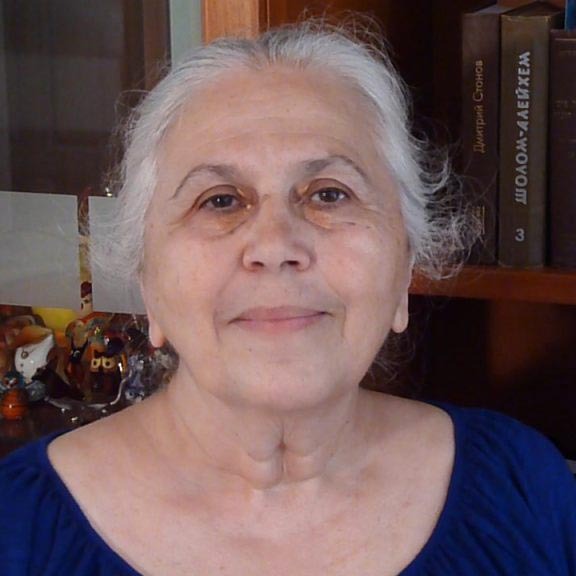 Russian senior citizens settled in government-subsidized housing. The culture shock was behind us. The suburbs beckoned. 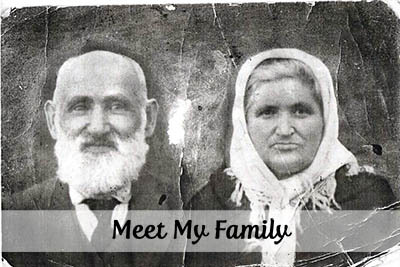 Almost the entire Chicago contingent of the Soviet Jewish immigrants started their American life in Rogers Park. Like everyone else, we drove huge used cars and station wagons that stalled on each corner. Like everyone else, we schlepped discarded treasures from alleys and garage sales. And like most, we spoke with an accent. After all the anxieties and fears and uncertainties of immigration, we exhaled – this was home. 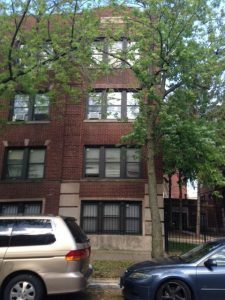 Would you like to share your memories of Rogers Park on this blog? I would love to hear from you.